He’d been told that everyone should own an Armani suit at least once in their life. After he bought his, he came to realize that it made him feel more self-assured and comfortable, somehow lifting him to a higher level. Now he found himself considering a stay at the Armani Hotel and wondered what he could hope to expect. Would it offer the same personalized accommodation and polish his suit inspired? Was this the Giorgio Armani hallmark, or was he expecting too much? After all, a hotel was just a hotel – or so he assumed. His first thought was that the towels probably bore, the Armani name, or the thread count of the sheets was exceptional, but he was soon to find it was so much more. He remembered Armani’s words, “Elegance is not about being noticed. It’s about being remembered.” As soon as he entered the hotel lobby he fully understood the meaning of these words, and relaxed. As a guest in the hotel he was provided a Lifestyle Manager. This personal attendant was assigned to him specifically and required to anticipate his every need, whether it be making dinner arrangements, touring, spa services, or handling other requests that arose. He quickly got into a rhythm of having nothing to worry about and few decisions to make. He felt cared for and respected - comfortable and special, and immediately knew this was where he belonged. Like an Armani suit, the hotel was a perfect fit. An elegant blend of sculptural and sensual aesthetics, Armani Hotel Milano offers a realm of fashionable beauty inside one of the world’s most enchanting cities. 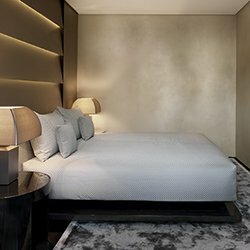 Personally designed by Giorgio Armani himself, Armani Hotel Milano caters to the sophisticated traveler, with a uniquely blended atmosphere reflective of the history, art, culture and design of historic Milan. From the incredible rooftop spa offering peace and serenity high above the rooftops to the breathtaking panoramic views from the award-winning dining venues, your stay here is undeniably Armani. Early check-in/late check-out based on availability. Room upgrade based on availability. Welcome Armani amenity upon arrival. Complimentary cocktail per guest/per stay (between 6:30 – 9:00 pm). Complimentary Internet access. Complimentary mini-bar (excluding alcohol). The 190 square meters Armani Signature Cinema Suite has an impressive living room and a sweeping circular staircase to the en-suite bedroom above, and a private kitchen. Private cinema with a plush sofa and extra-large TV. Experience the privileges of exclusive Armani amenities and distinguished service inside; immerse yourself in the exhilarating views of Milan on the outside. The Armani Presidential Suite, 190 square meters, with the possibility of connecting to an Armani Deluxe Room, has a stunning view of the Milan skyline from your very own full-length terrace. The view is unlike any other and so are the comforts. At an expansive 112 square meters maximum, the Armani Ambassador Suite is what you choose to make it; family retreat or private venue. A walk through the vestibule entry reveals spacious living and dining areas, an opulent bedroom with a large wardrobe, and a full-sized marble bathroom to start your day with vigour and end it with serenity. 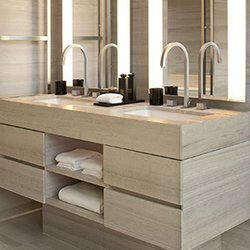 Vestibule with guest restroom, thoughtfully equipped living room, exclusive Armani-furnished bedroom, marble bathroom with shower and bathtub areas and spacious cabinet. All this and a host of superior comforts packed into maximum 95 square meters of suite space; plus the possibility of connecting your suite to an Armani Deluxe Room. Enjoy an ambiance of up to 50 square meters; an array of lavish comforts and well-appointed amenities, including exclusive Armani furniture and fixtures and top-of-the-line entertainment. If you seek more space, ask for a connecting Armani Deluxe Room. Feel at home in a refined ambience of up to 65 square meters, in pure Armani style. Step through the vestibule entrance into an intimate living room with a multi-use workstation, and a classy bedroom with tasteful furniture. The luxurious marble bathroom features individual shower and bathtub areas and exclusive bathroom amenities. With up to 44 square meters of privacy and comfort, the Armani Deluxe Room is a true home-away-from-home, be it a quick stopover or an extended stay. Should you seek a more spacious ambience, there is a possibility of connecting to an Armani Première Room.